The smartphone market is now considered as an open market, and hence a number of players come to be a part of this market every day. Considering the fact, there are hardly some brands that are able to sustain in the current competitive market. There are some companies that have offered beautiful products to the buyers. This has led the brand to the new levels. There are some new brands in the market that have gained the popularity among the users, and one of such brand is famous as Gionee. It is a known brand from the land of China. The company has launched some beautiful devices in the last couple of years that have made the market leaders also think twice before manufacturing new devices. Gionee was established in the year 2002 by founder Liu Rong. The company was involved in research and development along with production and selling of cellular phones. The company got its CDMA and GSM phone production license in the year 2005. In the year 2011, Gionee reached to a market share of 7.2% and the GSM market share of about 11.2%. Gionee got first place in its domestic market and third place across the globe in the cellular market. It is the quality and features on the cell phones only that have made the brand much popular among the buyers. Since 2011 there was no looking back for the company. It expanded its wings across countries like Vietnam, India, Myanmar, Nigeria, Taiwan, Philippines and Thailand. Presently the Gionee phones are sold across countries like Bangladesh, Pakistan, Thailand, India, Indonesia, Malaysia, Vietnam, Russia, Africa and the Middle East. The Gionee phones are known for being stylish, pocket-friendly and easy to use. They aspire to make the lives of buyers easy.Gionee has launched some amazing devices which have caught fancy of people. And this time across the company is all set to launch its brand-new device with Gionee A1 Plus which is expected to hit the Indian market in September 2017. The Gionee A1 Plus impresses the buyers at the first look itself. The device flaunts a huge 6-inch display with IPS LCD screen and capacitive touchscreen with 16M colours. The device offers a screen resolution of 1080 x 1920 pixels with 367ppl. The dimensions of the device include 166.4 x 83.3 x 9.1 mm and it weighs around 226 grams which make it a heavy handset which might prove to be a drawback for the device. Gionee A1 Plus responds quite well to multi-touch. The phone is available in colour variants of Mocha, Gold and Gray. This 226grams weight device has got 71.43% screen to body ratio which makes it much helpful for easy navigation. Compared to other devices in the market one can easily use this device even with single hand. The Gionee A1 Plus operates on the latest Android version 7 Nougat which is rare to find in the phones that are already launched in the market. The phone is powered by Mediatek MT6757T along with 2.5 GHz Octa-core processor and Mali-T880MP2 GPU. Hence, as far as the software is concerned, it can offer a beautiful and user-friendly experience to the buyer. The Gionee A1 Plus impresses on the camera front as well. The device is packed with a dual camera with 13MP + 5 MP along with features such as f/2.0, LED flash and phase detection autofocus. Among the other features, one can find 1/3” sensor size and 1.12 um pixel size along with HDR, Panorama, Geo-tagging, touch focus and face detection. The device allows video recording at 1080p @ 30 fps. Hence the camera of this device is also considered as one of the best quality that can offer high-quality image capturing and video shooting in different modes. The phone offers a front camera of 20 MP with f/2.0 and ½.8” sensor size. The Gionee A1 Plus performs really well on the storage and battery front. The device offers an internal memory of 64GB along with 4GB RAM which enables efficient functioning of the phone without getting hanged. One can expand the memory up to 256 GB with the help of micro SD card which can be inserted on SIM 2 slot. The device is powered by a Li-ion non-removable 4550 mAh battery which is said to offer long sustainability even in stand-by mode. The connectivity options of the device include Wi-fi, Bluetooth, GPS, GSM, LTE and HSPA along with FM Radio and USB slot. 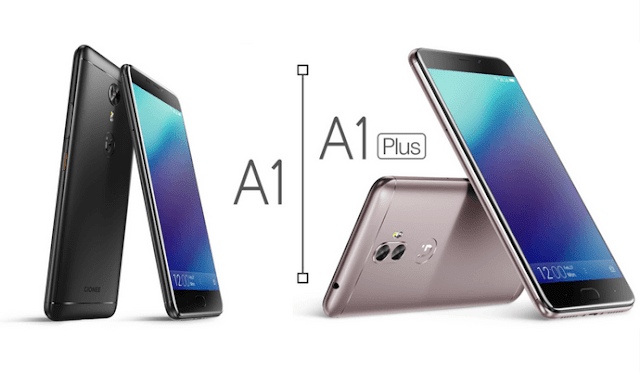 The Gionee A1 Plus is a dual SIM device with both Nano SIM slots. The device is equipped with sensors such as anaccelerometer, fingerprint sensor which is rear mounted, proximity and compass sensor. The Gionee A1 Plus price is estimated to be around Rs.26000. At given price, the device will get its position in the higher segment. The device is expected to face competition from Samsung and Xiaomi in the higher segment. Gionee A1 Plus definitely looks promising as it is loaded with excellent features. The device is a must buy for its powerful performance, gorilla glass, fingerprint sensor, amazing camera and decent connectivity options. It is doubtlessly the best option for people who wish for huge display and efficient camera. The only probable minus point is its Hybrid SIM slot which might be a drawback for some. The device has been positioned in the higher segment where it will face a fight from Xiaomi and Samsung which are equally powerful and popular brands. However, owing to an impeccable performance from the previous phone, one can expect Gionee A1 Plus as well to capture a remarkable segment of the market. Since the device has not been launched yet; it is difficult to comment on its performance. Therefore, only time will decide the fate of the phone.